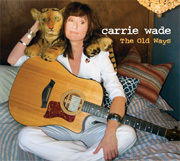 Originally released in 2009, and getting a much deserved second push, Carrie Wadeӳ debut album harks back to the classic singer-songwriter albums of the early 60′s, but with plenty of contemporary nuances and a production that touches on a variety of acoustic genres. Her voice, engaging and melodic, provides sweet contrast to the atmospheric arrangements that rarely over play the songs. Indeed, the songs are always placed at the very core of proceedings and Wade provides both hooks and emotional substance. The best tracks here ‘Needles In The Waves’ and the title track would sound perfectly comfortable on daytime Radio 2. 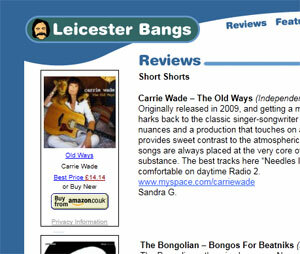 This entry was posted in Reviews and tagged carrie wade, country, folk, leicester bangs, music review, rock, will engel. Bookmark the permalink.